Investing in Our Associates and Benefitting Our Customers! As we announced our facility expansion in last month’s newsletter, LAI International has also invested in our Associates to ensure they can perform at their peak as we continue to grow our company in technology, Associates, Customer experience and revenue. We have embraced the Integrity Selling program for our Business Development team and Site Leaders in an effort to be more effective in finding solutions for our Customers complex problems. In the last half of the 2017 we watched opportunities grow nearly 100% in our pipeline! Customers have recognized our teams as being more effective in meeting the challenges we accept from them, to create a better experience from job statement through new product introduction and on time delivery in shorter span times than our peers. We have also invested in our execution teams within operations at each site with a similar commitment that focuses on Customer Service, brainstorming how we make the experience within our factories more satisfying for the Customer teams that visit and buy off product and audit our processes throughout the year. We are looking forward to our Customers’ feedback on how much our teams have improved in executing the commitments we have accepted with each order received. LAI International is poised for another record breaking year of growth due to our teams’ hard work and our Customer confidence and we plan to execute on those opportunities with these tools and processes we have put into standard work within LAI International. As LAI International continues to focus on growing our Additive Manufacturing (AM) business, the IPT continues to push the bounds of process control by not only evaluating what’s going on in the machine, but also outside the machine as well. A recent example of this occurred when the AM team identified a non-conformance inside a few parts in an evaluation build when it was removed from the machine. They were able to correlate the build height of internal and external indications to the time of plant maintenance outside the room where a scissor lift was being used. This sparked many questions on electric motors and the influence on a calibrated Electron Beam Powder Bed Fusion machine. Within a few days, our technical team was able to successfully analyze, duplicate, and correct the issue, and now not only has a deeper understanding of the process, but also identified controls to eliminate the occurrence in the future. This is a great example of LAI Associate’s attention to detail, and drive to push the limits of the technology to the next generation, production environment that the industry needs. To learn more about LAI’s additive manufacturing capability, and the controls put in place to eliminate electronic influence, come visit us at the Additive Manufacturing Users Group (AMUG) meeting in St. Louis. Our Associate Mat Lewis will be presenting the project, “Environmental Effects on EB-PBF” on Thursday, April 12th at 11:30 am. LAI International will be proudly exhibiting at AeroDef Manufacturing 2018, March 27 and 28, at the Long Beach Convention Center in California. AeroDef Manufacturing is the leading exposition and technical conference for the aerospace and defense manufacturing industry. 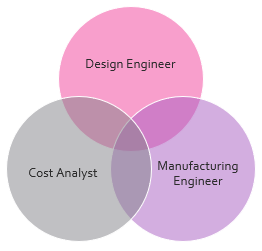 Produced by the Society of Manufacturing Engineers (SME), in partnership with industry Original Equipment Manufacturers (OEMs), their mission is to foster innovation across the extended enterprise to reduce costs, expedite production times, and maintain manufacturing competitiveness in the global economy. actually experience on the exposition floor and in the in-depth conference sessions. It's the one event that brings together high-concept, integrated solutions and real-world applications. 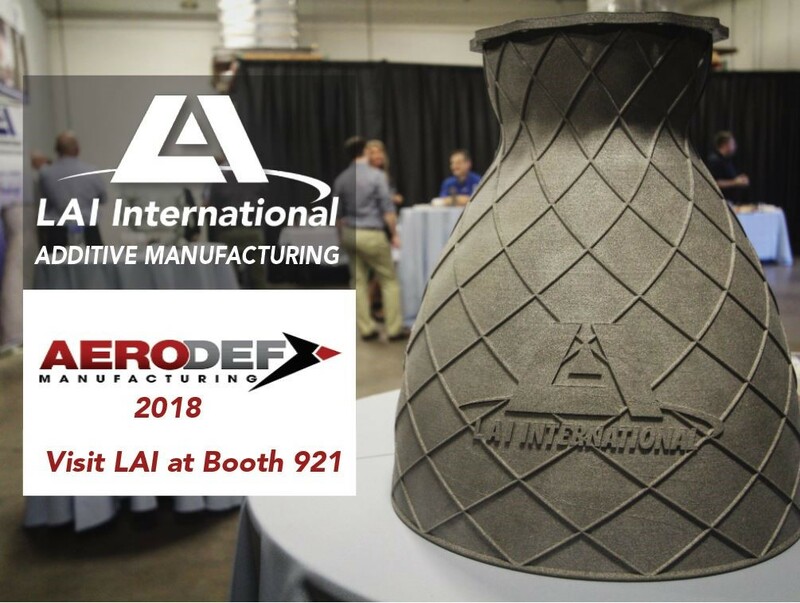 If you have a stake in aerospace and defense manufacturing, you can't afford to miss AeroDef Manufacturing, and you owe it to yourself to visit the LAI booth! When designers are urged to be creative and innovative, the design space box which meets fit, form, and function requirements expands exponentially. This new idea of starting from nothing instead of starting from a block of material, while overwhelming for some, becomes limitless for students and young design engineers - without decades of strict rules and guidelines hanging in the midst. LAI International will be recognized at the 14th Annual Manufacturing Leadership Awards Gala, which is to be held on the last day of the Manufacturing Leadership Summit, June 11-13, 2018 at the Hyatt Regency Huntington Beach Resort and Spa in Huntington Beach, CA.